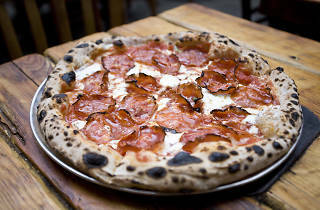 Pizza hobbyist turned pro Paul Giannone produces truly original pies at this rustic Greenpoint eatery. The best pizzas here are mixed-media masterworks with gorgeously blackened crusts covered in crispy nooks and pillowy bubbles. The Honey Jones—a frequent special featuring honey from a Brooklyn beekeeper, Gorgonzola, mozzarella, cherries and wispy prosciutto—beautifully balances sweet and salty. The Rooftop Pie includes crunchy Brooklyn-grown kale, gorgeously singed atop mozzarella and sausage. Ask for a seat in the back for a view of the roaring oven—a custom-built, while-tiled dome that burns up to 1,000 degrees. Amazing pizzas and great service. Be sure to look out for Paulie! Always pleasant, always satisfying. Mr Paulie Gee oven frequents his flagship and is the friendliest owner I've met yet! These pizzas were STELLAR. We ordered two (for three people) and it was perfect. I'd recommend the pizza with the spicy honey and pepperoni—it was by far the best. So so so good! Every pizza is made fresh and I've never had a "bad" pie here. 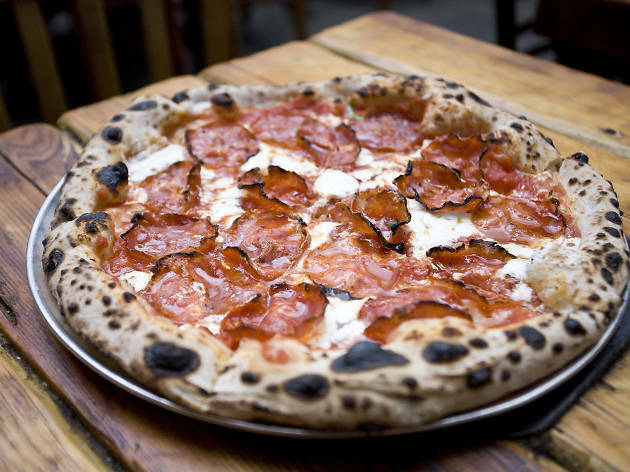 You must try the hellboy, one of their most popular pies, that has a slight drizzle of mike's hot honey, fresh mozzarella and sopressata (fancy pepperoni.) The only downside is they stopped letting you get pies to go, but they really should be eaten fresh from the oven. They are also ONLY open for dinner. One of the best pizza spots in NYC!